Using wireless Wifi Internet on mobile phones have always been a charm and convenience for the on travelling. I bought Nokia N95 just because it has a Wifi in it. I have an Asus motherboard in my PC which has a built-in Wifi Access Point in it. 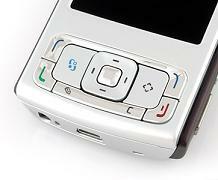 I tried a lot but the Wifi never worked for me on Nokia N95 Mobile Phone. Whereas, my blackberry mobile set, Sony PSP and Laptop used to connect through that same Wifi AP. The problem was very irritating for me and I had to find the fix to it. 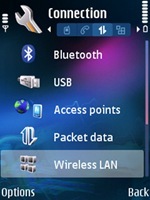 Nokia N95 used to connect to the Wifi and also even identifies the Access point, but when I used to try browsing, it used to give an error “No Gateway Reply”. Finally I came up with the solution and I fixed the problem. 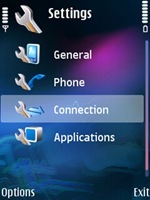 Here is the guide on how to fix Nokia n95 “no gateway reply” error on wifi. Open the phones ‘Settings‘ application. [ad#ad-taalz-inpost-right]Select ‘Connection‘ from the menu. 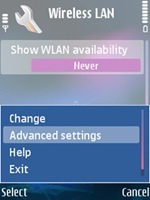 Scroll down to ‘Wireless LAN‘ and select it. Hit the options button (left soft key) and select ‘Advanced Settings‘. 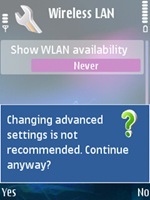 When the following warning screen appears select Yes to enter the Advanced Settings screen. 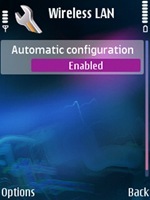 [ad#ad-taalz-inpost-right]Click ‘Automatic configuration‘ to set it to Disabled. 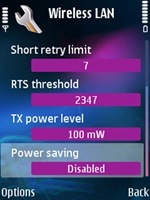 Scroll down to the ‘Power saving‘ option in the menu and set it to Disabled. That’s all my friends. Just disable this option and there you go! 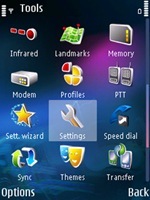 Now you can browse and surf Internet on your Nokia N95 through Wifi.